Are you ready for the holidays? They are coming fast. I like to freak out a couple weeks before they happen to get the stress out of my system. Then, I begin to plan. 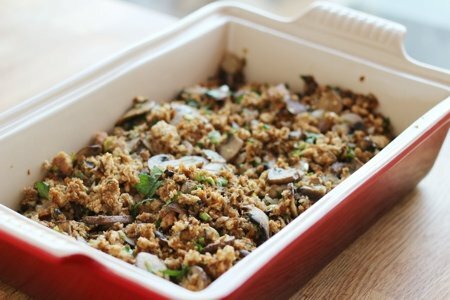 This recipe for stuffing is the result of thinking about how I would feed a vegetarian and a vegan coming to my house for Thanksgiving. Do I want to order Chinese food for them? Yes, I do. But, I won’t do that because I am too nice. The key to making a flavorful stuffing without a cup of butter is to use flavorful ingredients. California Olive Ranch Extra Virgin Olive Oil has buttery and fruity notes and I use it for my salads as well as this stuffing. I first tasted it at an olive oil tasting in San Francisco - which was the first time I had ever noticed the different flavors in olive oil. I fell in love with California Olive Ranch and was thrilled I could find it in Massachusetts (far from California). In addition to great tasting olive oil, I use mushrooms instead of sausage to lend that “meaty” flavor and onions, garlic, sage, scallions and parsley to hit all the herbal tastes. The mushrooms release their juices when they are sautéed so you don’t need to add any stock. Finally, I use whole wheat bread for the bread crumbs to add earthiness. Do not buy bread crumbs to make this stuffing. It takes about ½ loaf of fresh bread and a food processor or blender to make your own and they are SO much better. I use my food processor to mince the onion and garlic, too. Note: To make 6 cups fresh bread crumbs, pulse about 5 slices bread in blender or food processor. Put crumbs on a rimmed baking sheet and bake at 400F until toasted (about five minutes).